Ten thousand warplanes flew from or over Maine during World War II. Over the course of the war, a total of 48 aircraft crashed in the state accounting for 143 deaths. The vast majority of those planes made it safely to their destinations, but it was certainly not unheard of for one of the thousands of planes in the sky to fall to earth before they crossed the ocean for the war. But there was a day, a single day, where two bombers crashed within four hours of each other, claiming the lives of 27 people. This day remains the worst day for aviation in the state’s history. Aircraft 1: July 11, 1944 -Just after midnight, an 8th Air Force B-17G Flying Fortress heavy bomber (SN 43-38023) takes off with a 10 man crew from Kearney, Nebraska headed for Dow Army Air Field in Bangor, Maine, and then to Gander, Newfoundland, en route to a base in the English midlands, one of seventeen in a group, though it wasn’t strange for Cast to be flying on his own – it wasn’t actually common practice for pilots to fly in formation while on route, except during a bombing raid. Cast and crew were on their own until they made it to their destination. Everything went according to plan until…well, it will never be known exactly what happened to cause the plane to crash into Deer Mountain in Maine. All we can do is speculate. We have no way of ever knowing for certain what happened to the aircraft to cause the events that happened that July day. We do know that the weather over the Appalachians was foul and the crew must have flown high enough to avoid most of the turbulence. We can imagine that they were tossed and buffeted about with wind, thunder, rain and hail all part of the mix. Anyone who has experienced turbulence knows the feeling of being thrown about like a bb in a can.The plane can be lifted or dropped several hundred feet without any warning. Other planes from the flight group reported these conditions, so we can safely assume that Cast and crew also experienced a similar set of events. We do know that the radio operator made his last scheduled contact with ground radio operators at around 9:30 and that this was something he did every half hour to help maintain his position. At around 10 AM when the radio operator was scheduled to make radio contact with the ground to help maintain his fix, he found that he couldn’t raise anyone. He may have also found that he couldn’t receive any fixed signals or commercial radio stations. Perhaps they checked the radio equipment and found some smashed tubes, a common occurrence. Perhaps they even replaced the broken tubes in an attempt to make contact and determine their position. But they never make contact with the ground again. But all was not lost: there were other ways of finding their way. It is possible that the rough weather and turbulence caused the gyroscopic magnetic compass to malfunction, giving a false reading. There was also a radio compass that was quite likely not working, either. Cast and his navigator, Second Lieutenant William Hudgens, Jr., had very few tools to help them find their way. It might have seemed pretty hopeless but for their last resort for determining their position. In those days, when weather would cause a pilot to lose his position, he had to rely largely on navigation by dead-reckoning, using radio beacons and radio fixes from airfields along the way. If dead-reckoning failed, a pilot could use a sextant and navigate using the positions of celestial bodies, but it appears that Cast was unable to use either navigation system to help him find his way. It had come down to his last option: he would have to rely on his eyesight alone. This combination of bad weather and loss of radio contact probably caused Lieutenant Cast to fly off course and after over twelve hours airborne, it must have become clear to him that he was running low on fuel. Using only his vision to guide him, to see the world below he would have needed to fly below the cloud bank to look for anything that could help him determine a course. One can imagine all of the members of the crew straining at their respective windows to see something, anything, that could inform them of their position. They would have had to rely on the aircraft’s intercom to communicate, with the roar of four 1200 horsepower engines whining loud and reverberating throughout the plane. We know that they were still airborne at 1:30 in the afternoon and their fuel must have been dangerously low. The B-17G burned 50 gallons of fuel per hour, per engine and had a capacity of seventeen hundred gallons, most of which was already gone. They must have checked their charts and understood that they had been circling the town of Rangeley. They must have been so relieved to know that close by was an airstrip, a runway, and a safe landing. Flying in a long circle for more than an hour, they must have recognized where they were because Cast finally steered the plane towards Rangeley’s tiny airstrip. But there was still a final problem: because they had been flying low enough to look at the terrain, they needed to gain altitude to come in on their approach.But the B-17G had a relatively poor rate of climb, at only nine hundred feet per minute. To get the plane up to where it rightfully belonged to be safe would take minutes. They never made it to the runway. 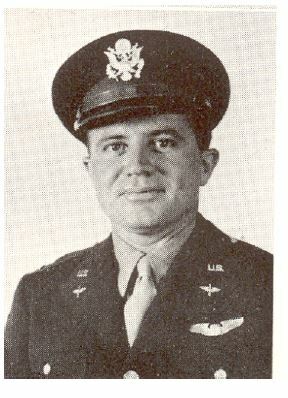 Details from the crash site investigation showed that they must have been flying extremely low because as Lieutenant Cast turned to bank, the B-17s wingtip caught on a treetop, causing the plane to twist and corkscrew into the ground at full speed.The wreck created a swath in the forest 200 feet wide for a distance of over 800 feet before it finally stopped. With so little fuel left in the tanks, there was no fireball or great explosion, just a sudden crashing sound and the snapping of trees and timber, followed by a long, hollow silence. No one survived. All were under the age of twenty-seven years old. The wreck was discovered three days later after an exhaustive search, the few crew remains were taken to Bangor and the remains of the plane were left to sit in the middle of the north woods, perhaps to be seen by a hunter now and again as the years went by. Eventually a logging company came upon the wreckage years later and buried the wreckage. Later, it seems, another storm uprooted some of the trees that had grown over the wreck, exposing it again to the elements and inspiring a few people to erect a stone to the memory of the fallen airmen. The remains of the B-17 lie beneath the forest and a stone marker is all that remains to mark the spot where these brave men met their end on a blustery July day in Maine. 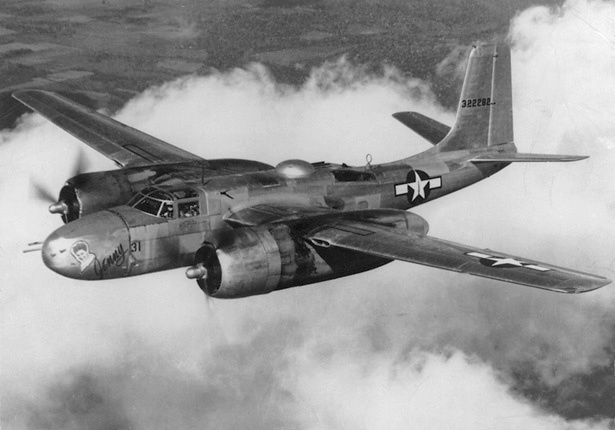 Aircraft 2: A twin engine A-26 Invader attack bomber from Barksdale Field in Louisiana, took off from Bradley Field in Connecticut after refueling. It was being piloted by a Mainer, Second Lieutenant Philip “Phee” Russell, a flight instructor, from South Portland. This journey was a kind of gift to Russell from the Army, called a “long-distance training mission” to his home state for a well-deserved break and visit home. He was almost there, with only 170 miles between Russell and his wife and daughter. Russell was a flight instructor. He knew how to pilot an airplane and wasn’t a rookie by any measure. He had made it through much of the same weather that Cast and his crew had encountered and he had been lucky enough to stay on course. His wife and baby daughter were on the base, waiting in the the observation tower, ready to greet him as he exited the plane.The fog was so thick that afternoon that the base commander had actually closed the runway, but Russell was close. At 4:35 PM his voice came over the radio requesting landing instructions. He was on time to land in Portland, but time was running out. The people in the observation tower reported seeing his Invader come out of the fog at two-hundred feet. What happened next happened so quickly. Was that smoke coming from his starboard engine or just a trick of the light in the fog? The tower immediately instructed Russell to climb to 1500 feet, but didn’t get a chance to finish their instructions to head to another field in New Hampshire. For a reason we will never be able to truly ascertain, Russell never touched down on Portland’s runway, though he flew directly over it at high speed and low altitude.As he was circling, his wingtip caught the ground and the Invader cart-wheeled, plowing into the ground. He met his end when the plane collided with Westbrook’s Redbank Trailer Camp, full of workers building Liberty Ships at the New England Shipbuilding Corporation’s facility. A fireball with 100 foot flames lit up the sky as the A-26 Invader made impact and created an impact crater. Nineteen people died in that trailer park, including Russell and his flight engineer, Wallace Mifflin. In the Portland area, this incident would be remembered as the Long Creek disaster. A small memorial to the victims of the crash has recently been erected. 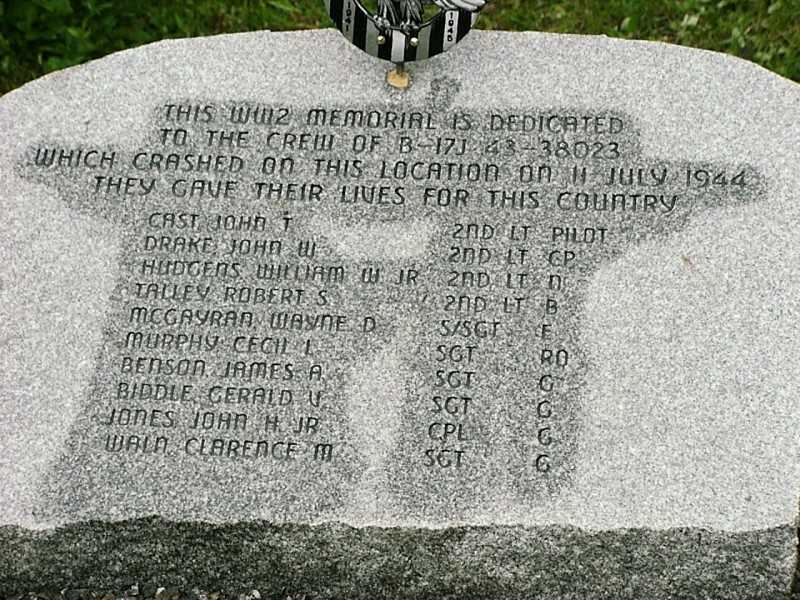 On that fateful day, 27 people lost their lives due to a strange combination of weather, confusion and reasons we will never determine, July 11, 1944 marks Maine’s worst day in aviation history. Maine remains a place where the sky seems filled with aircraft either coming from or going to Canada or Europe, planes whose contrails fill the sky with a kind of white-lace reminder that up there, too high to hear, thousands of people fly over us on their way to somewhere beyond. But every now and then, often on a quiet night, late in the evening, you might find yourself drawn to the window to see if you can glimpse whatever it is that is making that sound that’s caught your ear. It’s a kind of low, loud whine in the distance, a deep-throated hum that seems louder and lower than it should be ,just above your head, growing in intensity as it passes over and then diminishes into the darkness, continuing its lonely journey. I’ve heard that sound more than once in my life and I know it might simply be a lovingly maintained museum piece on its way to an airshow somewhere, but there is a part of me that wonders if that sound of roaring engines might also be a memory, an echo from a time when thousands of planes filled with tens of thousands of young men, flew overhead towards their own uncertain futures. Today there are many who visit the site in Rangeley that commemorates the last flight of the B-17 piloted by Lieutenant Cast. If you are interested, it’s located west of Rangeley off Route 16, just before Cupsuptic Boat Launch. Johnson, Alan W. “A B17 Memorial”. Aziscohos Lake Preservation Council. aziscohos.org, 30 May 2011. Noddin, Peter. “Aviation Archeology in Maine”. Mewreckchasers.com. Accessed 26 June 2018.